The Boyer-Bransden Micro MKIII is a contactless ignition system utilising an advanced and patented trigger switching system and featuring electronic, advance and retard. 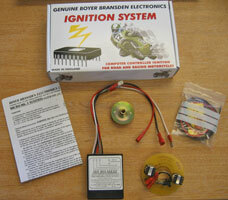 Engines function best with a retarded spark for starting and low revs, but need ignition advance to run at high speed. The Micro MKIII's analogue system simply advances the spark at a set rate from fully retarded to maximum advance, as engine speed rises from zero to 4,000 revs. Thus eliminating the inaccuracy of mechanical advance/ retard units.